In the works of the Marquis de Sade, most if not all of the major villains featured are perverse criminal psychopaths on a truly monumental scale. 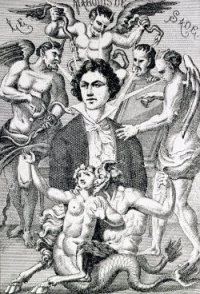 These include the Duc de Blangis, the Bishop, the Président de Curval, and Durcet in The 120 Days of Sodom (1785); Dolmancé, Madame de Saint-Ange, and Le Chevalier in Philosophy in the Bedroom (1795); and Clairwil, Noirceuil, and Saint-Fond in L'Histoire de Juliette (1797-1801). Sade's novels and stories ostensibly satirize (and also subvert and hyperbolize) the genre conventions of the eighteenth-century picaresque novels and Bildungsromans of Voltaire, Diderot, Rousseau, Richardson, and Fielding, as well as harking back to the grotesque and scatological satire of earlier writers like the fourteenth-century Chaucer and Boccaccio and the fifteenth-century Rabelais. In addition to social and literary satire, Sade exploits the generic trappings of the libertine novel for explicitly pornographic purposes. He also manipulates these received literary forms as a guise from which he may expound his own atheistic, materialist cosmology — largely derived from David Hume, Baron d'Holbach, and the "natural philosophy" of the seventeenth and eighteenth centuries. Sade's writings also venture to proffer and illustrate an unfathomably brutish and nihilistic moral and civic philosophy purely for its own sake (although some have suggested that this aspect of his work is merely a trenchant satire of the purported high ideals and extreme measures of the current French revolutionaries, particularly those of the radical sans-culottes as well as the Jacobins during the Reign of Terror). Sadean philosophy — and the sexualized bloodshed and perversion it seeks to sanctify — is partly drawn from the bleaker, more extreme implications of Machiavelli and Thomas Hobbes. Even more tendentiously, Sade also attempts to demonstrate how his code of sexual barbarism and murder mingles with, and inflects, his pitiless, atheistic materialist worldview — one that sees live human bodies as yet more raw matter to be abused and immolated and then finally consigned to, and devoured by, nature's insatiable compost heap. Among other things, Sade's libertines argue for the universality of their prescriptive savagery on the basis of the anthropological record of human and animal sacrifice, legalized state execution and torture, ritual punishments and mutilations owing to social, religious, and sexual taboos, along with countless other similarly sanctified brutalities that — at one time or another, in one form or another — have been practiced in every culture the world over. Largely mythologized (and for the most part, culturally unsanctioned) atrocities and paraphilias that are generally regarded, even in the most primitive and savage societies, as morbid, bestial, and/or otherwise subhuman — deviant practices like cannibalism, hematophagy, coprophagy, and necrophilia — are venerated and performed with imaginative zest by the pansexual, polymorphous perverse Sadean libertine. Given his Jesuit education, it is perhaps not surprising that Sade's fictions are saturated in a particularly fanatical and virulent anti-clericism characterized by mock-Jesuitical criminal catechisms and ratiocinative discourses, as well as extravagantly obscene parodies and desecrations of church sacraments, rituals, and iconography. While Sade's insistence on locating all of these debauched goings-on in claustrophobic chateaux, dungeons, and impenetrable forests is undoubtedly attributable to the long-term psychological pressures and effects sustained from his 27-year imprisonment, the literary results offer some notable parallels with the contemporaneous Gothic movement in fiction, exemplified by the novels of Ann Radcliffe. Nearly all of Sade's Gothic scenarios feature an encounter of some kind between the willful, perverse libertines and their unfortunate victims. The former become bound to the latter in a dynamic of sensual and suprasensual gratification (what Lacan was to later call jouissance) based on a calculated refinement and spectacularization of depravity, an anarchistic enjoyment of profanation and debasement (even a debasement of oneself), and a furious exhilaration derived from the deliberate corruption of virtue and the ritual destruction of innocents. In short, Sade's scandalous legacy constitutes the most extensive catalogue of psychopathological impulses, perversions, and paraphilias in world literature; but whether the author was himself a psychopath — or merely a narcissistic paraphiliac with a fevered imagination — is very much open to question. Unless indicated otherwise, the text in this article is either based on Wikipedia article "Sade and psychopathology" or another language Wikipedia page thereof used under the terms of the GNU Free Documentation License; or on original research by Jahsonic and friends. See Art and Popular Culture's copyright notice. This page was last modified 12:23, 4 April 2013.